It seems patriotism is slipping these days. Were my patriotism inspired by the quality of our elected leaders or the condition of our economy, culture, and standing abroad, mine might be slipping too. Fortunately, my patriotism and yours springs from a deeper, truer source. 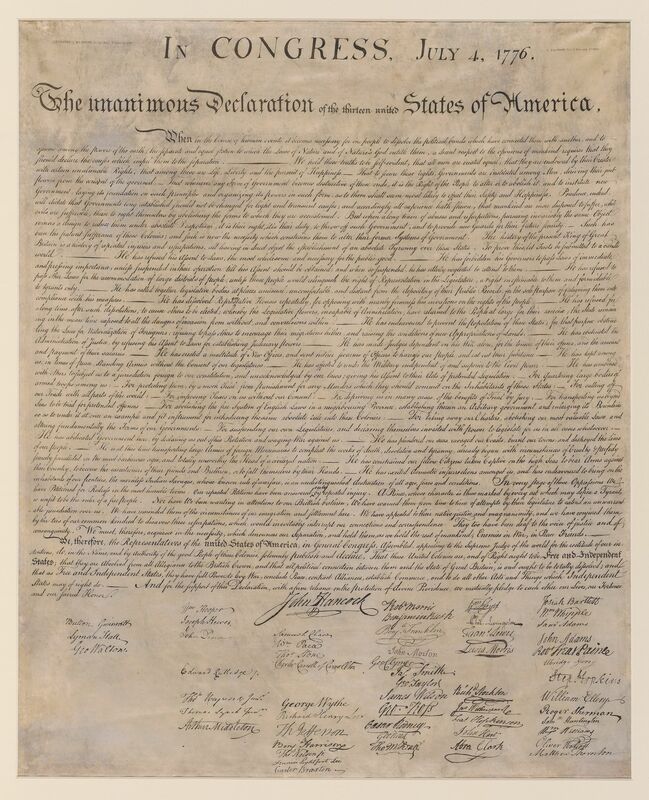 On this 238th birthday of America, our sense of patriotism can be restored by examining the document which represents today’s celebration — the Declaration of Independence. We know the Declaration best as the document that declared our independence from the mad-man King of Great Britain. We often reflect on phrases such as “We hold these truths to be self-evident…” or “When in the course of human events….” But we frequently stop there — failing to consider the context, complexity, and completeness of this parchment. This document was not the mere rant of fifty-six anarchists who simply wanted out from under a king’s rule. This document was not a simple knee-jerk reaction to popular opinion. This document was not just the statement of honorable men of extraordinary courage and an incredible sense of timing. The Signers of this Declaration were committing treason against the King of England by putting their name to this document. And even though today we would consider it almost a crime to be against this Declaration, our Founders signed at a time when the majority of their own neighbors didn’t even agree with such an action. Nevertheless, the Signers also understood the limits of forbearance. That is why they followed the above statement by reciting King George’s “long train of abuses” — twenty-seven violations of their unalienable rights — and proclaimed their (our) independence. You see, it was the Signers’ loyalty to the concept of a just government that enflamed their objection to an unjust one. It was their allegiance to the idea that rulers need not abuse the ruled; an understanding that rights come from God; and their patience while exhausting all available means of resolution, that led them to this courageous Declaration. Our Founders understood that our Country was more than the sum of its leaders and policies. Our Founders understood that had they merely declared themselves free without establishing cause, they would have subverted the reason for our patriotism today. Our Founders understood that patriotism must come from loyalty to something more than mere government. Similarly, our love for America must extend beyond the position we find her in today. Ours is defined by the ideals upon which she was founded. We are a people birthed by the inspiration of “the course of human events,” in the authority of “self-evident truth,” justified by careful consideration of the implications of independence, clarified by the recitation of specific grievances, and secured by the blood of those who have been loyal to this cause. This July 4th, I’m proud and grateful to call myself an American. An no matter how inept our leaders are or become, the patriotism I feel will be driven by the lineage of our founding — for it is the people of America bound through our lineage of self-evident liberty that causes us to be patriots. May God bless our America. Seth Morgan is a former state representative and the Chairman of the Conservative Republican Leadership Committee. Join CRLC’s growing family of principled, strategically minded Ohio conservatives at CRLCohio.com/PLEDGE.